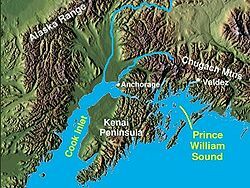 Prince William Sound ( Russian: Чугацкий залив Čugatski zaliv ) is a sound of the Gulf of Alaska on the south coast of the U.S. state of Alaska. It is located on the east side of the Kenai Peninsula. Its largest port is Valdez, at the southern terminus of the Trans-Alaska Pipeline System. Other settlements on the sound, which contains numerous small islands, include Cordova and Whittier plus the Alaska native villages of Chenega and Tatitlek. A 1964 tsunami, a result of the Good Friday earthquake, killed a number of Chugach villagers in the coastal village of Chenega and destroyed the town of Valdez. Most of the land surrounding Prince William Sound is part of the Chugach National Forest, the second largest national forest in the U.S. Prince William Sound is ringed by the steep and glaciated Chugach Mountains. The coastline is convoluted, with many islands and fjords, several of which contain tidewater glaciers. The principal barrier islands forming the sound are Montague Island, Hinchinbrook Island, and Hawkins Island. ^ "1989: Exxon Valdez creates oil slick disaster". BBC. 1989-03-24. Retrieved 2007-12-03.